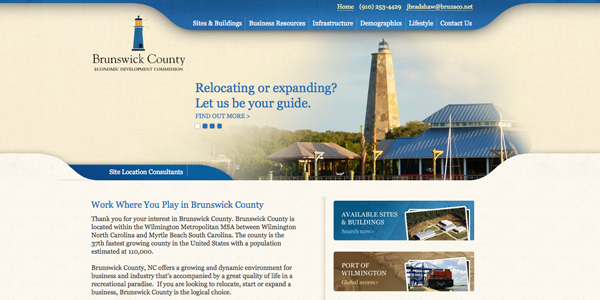 New Media Campaigns is excited to announce a new site for the Brunswick County Economic Development Commission. Tasked with promoting Brunswick county and attracting businesses, the EDC needed a website that was attractive and functional, highlighting and emphasizing its proximity to the coast and its many industrial and commercial resources. Designed by Liaison Design Group, the new site was developed and launched on NMC's HiFi Content Management System, ensuring quick load times, flexibility in design and implementation, and intuitive content management. The new design is straightforward and easy to navigate, and the graphics emphasize the recreational and commercial importance of the county's beaches and coastal features. Potential businesses can research infrastructure (railroads, shipping, etc. ), demographics, and recreational opportunities in the area through a series of menus, and integrated Google maps allow visitors to interactively explore available building sites and drill down all the way to street level. Visitors can also find information about Myrtle Beach and Wilmington, commercially and recreationally important areas outside of, but closely tied to, Brunswick county. Development on HiFi ensures that the site is search engine optimized so that businesses and individuals interested in a potential move to the county can find relevant information easily, and it also allows the flexibility to easily expand and update the site as necessary. The CMS also enables clients like the Brunswick County EDC to have and manage high-quality websites that are affordable and can be rapidly developed and launched.